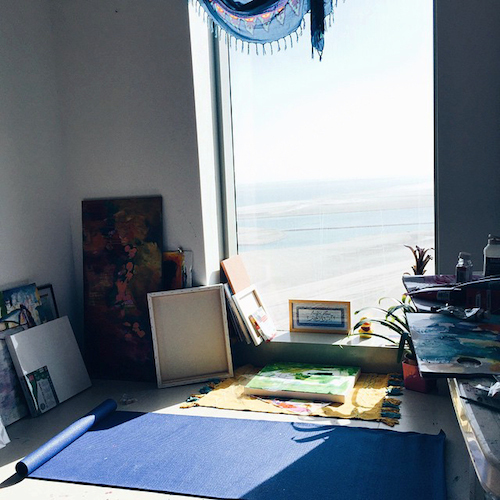 Amira is an artist in Abu Dhabi, creating her vibrant work up high on the 30th floor of a skyscraper. 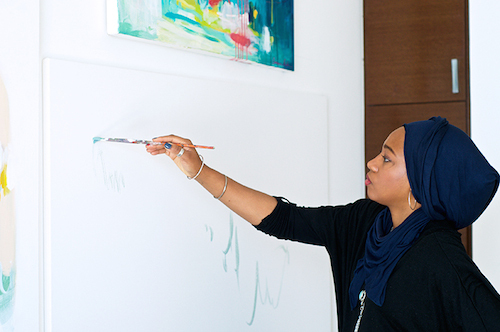 I wondered what her daily life was like, as an artist, an expatriate, and also as a Muslim who wears the hijab. She was gracious enough to discuss it all with us! My day begins at dawn. A small alarm wakes me to get up and make the morning prayer. This is the first of the five prayers we will pray that day, and it is the shortest. It takes less than one minute sometimes and getting out of bed so early to prepare and make it on time, many days feels rough. After that, the sun begins to rise. We live in a 60-story skyscraper in one of Abu Dhabi’s islands. 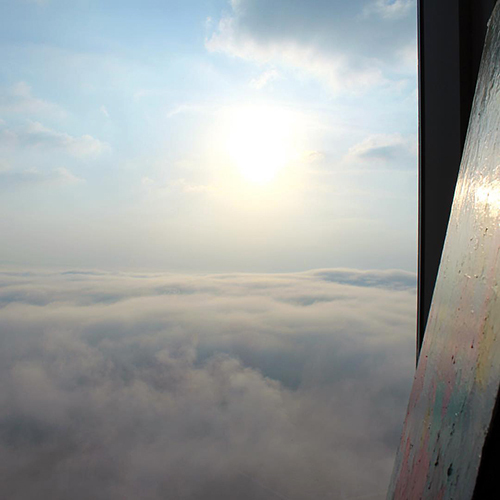 On the 30th floor, the view is usually breathtaking. The ceiling-to-floor windows throughout our corner bedroom gives us this near-panoramic view of the city, and I draw so much energy from watching the sun rise over the waters and lighting up the terrain. I usually sit on the floor for a few, then do some meditation or journaling. I’ve been trying to be more intentional about my mornings because I tend to get really anxious at the start of the day. For me, it’s the tug of business matters or social media. So I try and leave this for the middle of my day. I move into my rituals, lighting an incense or candle, making a pot of green tea, and then I head into my studio, which is a converted spare bedroom. I feel such peace in this room, and I love to paint as early as possible. I will break in a new canvas or do a few exercises on paper, often working on the floor with a podcast playing in the background. I feel like the freshness of the morning allows me to take greater risks in my work with no attachment to the end result. I’m just so entranced with the process and humbled that I get to do this for a living. By breakfast time, I sit down and have a protein rich breakfast. Sometimes steel-cut oats, boiled eggs, or pancakes. I love to cook and find it therapeutic. We usually sit and discuss ideas or things we want to accomplish for the week. My family, being on the other side of the globe, is usually on their way to bed so we like to check in with them and see what’s new. That keeps us going since it’s just us two here. When my husband goes to work, I report back to my office and work till lunch. I start working right away. I often think of how cool it is to be able to work remotely in our age of the internet. My office attire is my pajamas and painting clothes most of the time. Often I’m listening to podcasts on creativity, marketing, or once in a while a really engaging playlist of music. One of my favorite podcasts at the moment is the Unmistakeable Creative. I find the content really insightful and challenging. I usually get ideas in my head of how I want to share what I’m doing. My biggest challenge on most days is finding time and headspace to paint. It requires as much care as when I’m out of the studio as it does when I’m in. 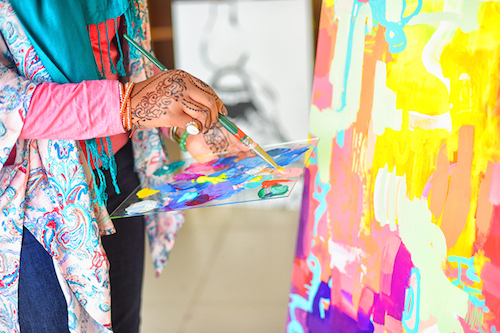 Physical health, emotional well-being, mental health, all of these things affect my ability to paint clearly, to flow through ideas and to build a cohesive body of work again and again. The second challenge is how do I get what I create out into the world. How can I take what’s in front of me and make it valuable for my followers, my tribe? It’s a delicate balance. I think many people think that it’s easy to be an artist. I’ve found that artists are ultimately really sensitive people. It takes an incredible amount of self-awareness for an artist to be sustainable because so much of what it takes involves saying no. Saying no to relationships that are harmful, toxic environments, even saying no to opportunities. The better I get at managing my own thoughts and habits, the better I can serve and show up in my work authentically. This is where meditation, prayer, and mindfulness comes up for me. You asked me to talk about my religion, and to share my thoughts on it these days in this world climate. Do I feel discriminated against? Do I ever feel like my actions are under extra scrutiny? I want to thank you, Gabrielle, for asking me these questions. I feel now more than ever, it is the things we leave unsaid, the stones we leave unturned that affect us the most, and because I am naturally an open book, I welcome honest and real discussions. I am Muslim. I have been wearing the headscarf now for the past eight years. It’s quite funny, actually, because it has come full circle. I first began wearing the hijab when I was doing some deep soul searching. After exploring different religions, I converted to Islam during my last year in college while studying abroad in London. Now, eight years later as an expat, my views on hijab have evolved so much but I still very much wish to wear it. While it’s certainly viewed as a public expression, my hijab is deeply personal and affords me a level of privacy I prefer when out in the public. Obviously, given the current political climate, Muslims – particularly American Muslims – are in a very awkward phase of identity and expression. It’s like the teenage times we all go through when suddenly your body doesn’t feel like your own or your skin is just breaking out and you want to hide. 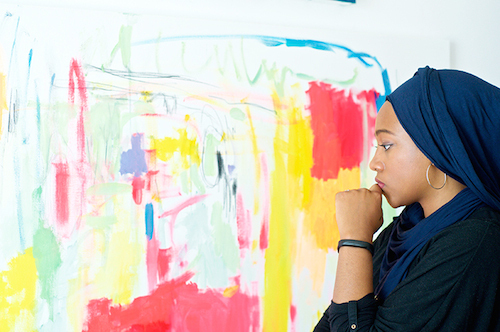 I think about my hijab often, particularly because I am planning to return now to the US. I grappled with the idea of taking it off, and my husband supports my decision either way, but ultimately I chose to keep it on. It has become so much a part of who I am and how I move through the world, that I feel like it would be quite unnerving to remove my headscarf. Although it is a matter of religiousness versus secularism, I am keeping my headscarf on – not just because of my faith in God, but also because of my belief that people are inherently good, and that America is still a free country with open-minded people. I wore hijab for several years in NYC, I also lived in Texas as a hijabi, and now finally in the Middle East. In each place, it is always interesting to see the assumptions people make about you because of it. People assume I’m from another country, yet my family is African American and trace their roots to the Carolinas and Virginia. Many assume that I was born a Muslim. Yet, converting to Islam was as much an intellectual decision for me as it was spiritual, although many people cannot equate the two. Nevertheless, as someone who studied Sociology, I am still fascinated with the fluidity of cultural symbols and identity in America. I just never knew that I would one day be so centered in it. I’m much more comfortable with being the observer rather than the observed. So, that’s definitely the hardest part of wearing hijab these days. Back to my day! I have a pretty set routine that works for me. I do the stuff that fuels and feeds me early in the day, and then get to the less fabulous parts later. So for me, that means painting comes first. I will paint until I’m tired and need a break usually four or five hours later. Sometimes I have to pull myself away or I will be late to an appointment from stealing just a few more swipes at the canvas. Usually the work will need to dry or just breathe for me to come back and assess it with fresh eyes later. By lunch time, I probably already have a few videos uploaded onto Snapchat and now’s the time to think about more deliberate content. It really is a daily duty of managing your social media presence. I don’t take the attention that I have for granted, not even for one second, and try to engage regularly with my people on Facebook and Instagram. After I’ve posted a photo or two to my social media, I usually hit my couch and face my website. There’s always work to be done. Inventory, orders to fulfill, or customer inquiries to respond to. I also really enjoy blogging so I will write a bit. I usually have to head into the city to check on things with my framer or send out some work. If not, I try and fit in a walk. If it is a slow period for me, I will completely indulge and just read in bed or read on my iPad in the bath. It feels so self-absorbed but I try and remind myself, hey, if I can’t stop in the middle of the day to soak up a good book, take a relaxing bath, or catch up on a show that I love, what’s the point, right? I find that cultivating these feelings of abundance affects my creative work positively, and allows me to have more success as a full-time artist. I usually meet a friend in town for lunch. Abu Dhabi is a very social place and people dine and brunch regularly. Many of my friends work from their own schedules. One is a professor, one is a jewelry maker, a few others are also self-employed. Just getting out of my own space and talking to another human being face to face is so nourishing. It’s even more heartfelt here because many of us are without our families, so my friends really take the place of that. We’re vulnerable, we talk about heavy issues, health problems, growing pains, marriage, business, you name it. It’s all there. We meet at a local cafe, usually some restaurant in a local mall because, for life in the UAE if anyone has ever been, everything takes place in malls. After lunch, I hit up the grocery store. I go to my local Waitrose and pick up something for dinner, maybe fresh flowers if I feel like I need them. We’ve been really health conscious for the past year or two out of necessity. About eight months ago, we stopped eating chicken and cut back on red meat and processed foods. Now we eat mostly seafood and lots of green salads and fruit. It makes my shopping much easier because I usually stick to the outskirts of the store and then I’m out. I find when I’m creatively blocked, cooking a nice meal can help get the juices flowing. But when I’m in the groove, I can’t really think about what to cook for dinner and usually settle with something easy like a big salad of lentils, greens, and toppings. Or we’ll order takeout. It’s a small luxury that we do a lot. We both like Indian food, and being in a city with more than half the population from Southeast Asia, we have no shortage of options to choose from. We’ve decided to move back to the US. I think neither one of us felt truly settled here. Even though my husband was born and raised here, his family is originally from Sudan and he traveled a lot in college and work throughout Europe and Canada. We are definitely alike in the sense that we see ourselves as global citizens. I think three years in Abu Dhabi was a good run, but I’m definitely anxious about the move. I wonder how it will affect my art career, although I imagine positively. And I’m worried about the political climate right now. I watched a lot of stories with horror of violence and felt sort of removed. But now faced with moving back to the US and re-assimilating, if you will, all of my layers are coming up to the forefront. Black. Woman. Muslim. Artist. They weigh on me constantly. In terms of what’s moving me creatively, I am approaching new ideas in my work about texture and movement. I’m so excited to continue to create abstractly and find it challenging and invigorating. I think if I ever figured out the secret combination to the perfect abstract painting A to Z, I’d stop painting. So, to anyone out there who knows all the answers, don’t tell me! I’m having too much fun discovering and experimenting right now. By moving slowly but steadily over the past 5-7 years from photorealism, to impressionism, and then complete abstraction, I now realize that I love two things the most in a painting though they are opposing: when the artist’s hand is evident (brushwork, form, movement) and also when the artist’s hand is completely invisible and the work looks like a Divine intervention or at least a fruitful accident. So I waver between loving works like Helen Frankenthaler one day to Basquiat the next and I can’t decide. This is probably the biggest challenge for me as an artist: accepting the fact that I am simply too curious to pick just one way to exist. Art allows me to live like a new person every single day. If I ever had to fit in a box, I’d go mad or just give up on painting altogether. By the end of the day, we’ve found our way back home and just zone out. I love to watch TV and have a nice meal. I think we need to do something just mindless to wind ourselves down before bed. We sleep really early because we wake up really early, which is sometimes hard for some of our friends or family. 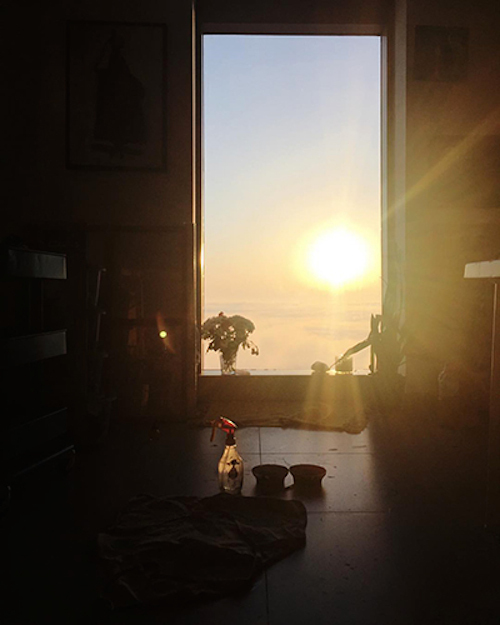 The culture here is to take a siesta and sleep fairly late, but we are both becoming more of morning people. End of the day I go back through emails. Tie up any loose ends that I can. I talk with my husband and just check in. Sometimes I will read a bit, very rarely do I paint in the evenings. The end of my day is special because it reminds me of what’s most important to me: the people in my life who love me generously and unconditionally, my passions and dreams, and my well-being. The last thing I think about before sleeping is almost always painting. It’s so interesting how after so much stimuli and just busy-ness throughout the day, that my mind does a colorful reel when I close my eyes. Sometimes I don’t want to forget and I’ll whisper out loud some combination, like “Remind me in the morning of this please…a dark background of blues and navies and then washes of pink and yellow marks.” We never remember in the morning, and by the time I’m up for morning prayer, the anxiety kicks in and that rush of adrenaline pushes me into the studio to go exploring again. Amira, this thought really moved me and I can’t seem to shake it: “I’m worried about the political climate right now. I watched a lot of stories with horror of violence and felt sort of removed. But now faced with moving back to the US and re-assimilating, if you will, all of my layers are coming up to the forefront. Black. Woman. Muslim. Artist. They weigh on me constantly.” I can only imagine, but my hopes are high for you. Please keep us posted on your transition. P.S. – You can see all my Call It A Day posts right here. Photos by Ekaterina Ivankina and Ingrid Nielsen. 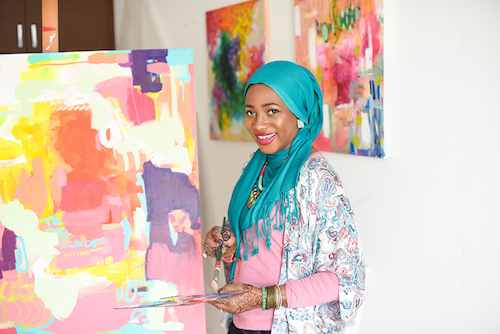 Thank you Amira for sharing yourself, your art and your religion. Thank you Shazia for reading. I loved reading about Amira’s day! I did a study abroad in college in Egypt, and all of the women there who were hijabed felt a very strong personal, religious call to it – I don’t think they were aware of all the western controversy over it. 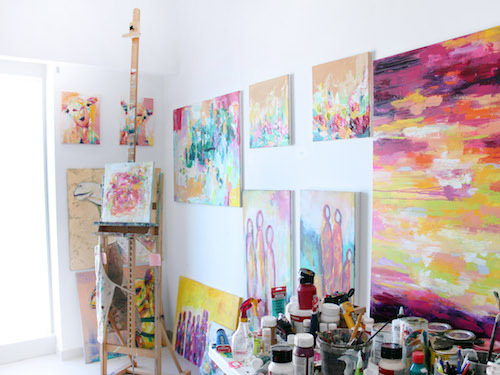 It’s also interesting to see into the daily flow of an artist, who both has to balance creativity with business. Thank you, Amira — your artwork is so compelling, and although I am not an artist, I could relate to much of what you express about mindfulness, connection, focus, identity, etc. Wonderful! Oh Mercy. First, and I know this is superficial, but woah Nellie do you look amazing in that turquoise! Second I love your art, there is a lot of life in it, just lovely, the colours, the movement, yum! Third, I am sad that you feel anxiety moving back to the country of your birth; said commentary on the land of the free. Fourth, I am hopes that your art will allow you the freedom and peace to exercise any fears, and joys that you gather as you come home to the U.S.
Good grief… apologies for all the typos in the above post. New computer and it’s ever so wonderful ‘auto correct’ have got me spinning! Love all of this! I did have to laugh at the first part though, because YAAAAAAS to the turquoise! I know! that is such a beautiful picture – with her beauty and the awesome giraffe!!! I so agree! Amira, you are strikingly beautiful, in a make me catch my breath kinda way. My stomach knotted up and I had a lump in my throat when I read your anxiety about moving back to the U.S. Your life looks so pretty and exotic and rich with experience, and it makes me sad to think that moving home could be diminishing in some way. Thank you for a peek into your lovely life. Prayers and best wishes for your future move! Loved reading this. All the best! This story was so beautiful! I love that she converted to Islam, and that was her own personal choice. I think it’s amazing that shes able to see the beauty in something that so many fear. Thank you Paige. I am sad to see so many people are afraid of Islam. It is sad, due to media and the state of the world, how it has taken such a beating. But for anyone who has done serious reading about Islamic history and theology, they may be pleasantly surprised. There’s so much to learn. We all have so much to learn about each other. Thank you. What a lovely, insightful, truthful and compelling story. Thank you. OMG THAT’S MY BIG SISTER I’M SCREAMING! Love you with all my heart! I’m beyond blessed to have you in my life. Keep inspiring others and making the world a better place like I knew you always would. 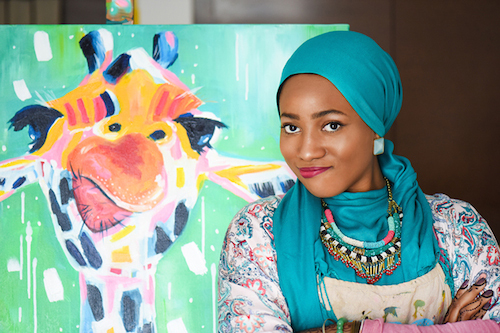 KEEP SLAYING ARTWORK AMIRA… WE LOVE YOU BEYOND WORDS. Pure Joy, Love & HugS ….. love to you and all that you continue to share your heart is filled with love for humanity. What beautiful art! I loved hearing Amira’s story. Best of luck with your move. LOVED, LOVED, LOVED this thought-provoking and insightful day. Thank you so much for sharing, Amira. So many thoughts to ponder on, but this one really struck me – “The better I get at managing my own thoughts and habits, the better I can serve and show up in my work authentically.” So lovely and true, for ALL of us! Thank you for sharing, Amira! Your artwork is spectacular, and I love reading about your inspiration and method. Speaking of inspiration, those views! Mamma mia! As a white, non-Muslim American, the current political climate concerns me too (like, do I want to have children if this is a glimpse into the future? Not looking promising.). Anyway, I hope your transition is smooth and I hope we get to hear an update! Lovely. I love your artwork, and that you shared so much with us. My favorite bit was “if you know all the answers, don’t tell me!” Haha! :D It seems like even if someone tells me all the answers I still have to discover them for myself. I’ve been making a little bit of art lately. It is absolutely nourishing, as you say. how nice of you to share all this warmth with us! i loved your words and thoughtfulness in your work and diligence and gentleness with strength and affinity with color and zest for life and as the others have said… your beautiful brown tones with that turquoise is so so wonderful to enjoy… thanks for sharing. What a wonderful life! 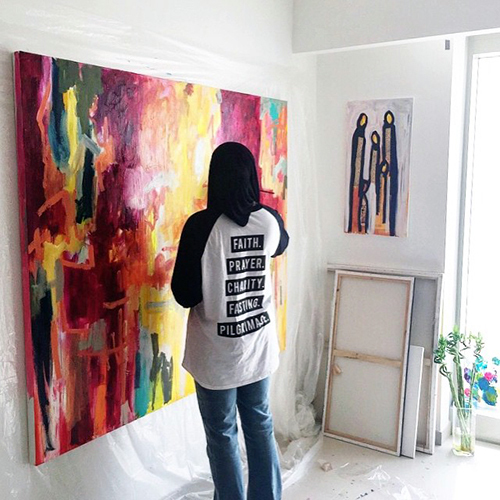 Thanks for sharing your beautiful artwork and story with us, Amira! So glad to see this on Design Mom! I know where my next piece of art will come from! Love, love, love. This is a lovely article, well-written, and about a delightful woman! I’ve admired Amira for over two years and I’m happy for and proud of her and her work. Wishing her and her husband smooth transitions to the US. Thank you, Gabrielle, for this spotlight story!! All the best to you, too. This is such an enjoyable read! Best wishes to Amira on her move back to the US. And now, I’m heading to her Instagram! Her works are beautiful! Amira, this inspired my socks off. I love following you and your journey. Loved every bit of this. I used to do a lot of painting and have set it aside in recent years as motherhood and family life have taken over my days. Amira really inspired me to unpack my paintbrushes again and start creating. I know how good it is for my soul. Best of luck with your transition back to the US. What an insightful article! I enjoyed reading this and I love your work Amira! Your color choices are perfection! I LOVE this. Thanks so much for sharing your beautiful art and your inspiring thoughts. Beautiful art, beautiful person. I do see from her 2019 instagram posts that she no longer covers her hair. I would love to hear from her how she came to that decision. As would I. Makes me feel both relieved for her and sad that I feel relieved (ie, the current state of affairs in this country re: bigotry). 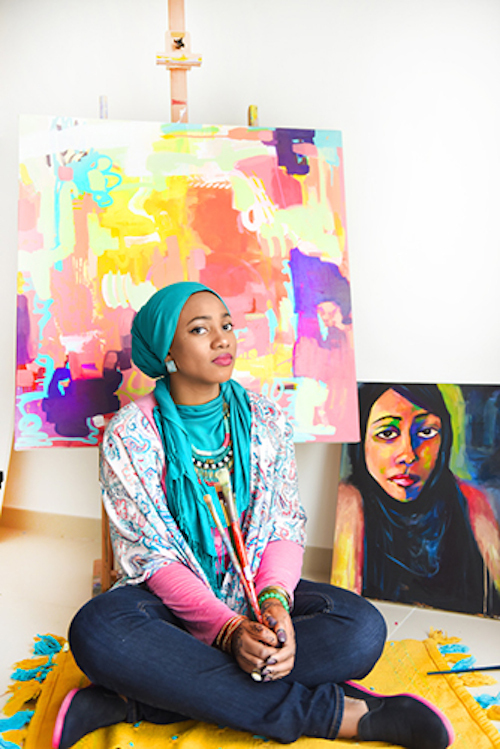 Amira, your art is amazing and gorgeous as are you, and you rock the hijab. I can understand your difficulties with that decision, though. Irish-American Catholic here, and I have been wondering how and whether to ask my Muslim friends about what they need right now. I don’t want to make anyone speak for their entire people. I hope you find the welcome you deserve back in the US.